I have written about my experiences playing From Software's “Soulsborne” games a couple of times on this blog. For that reason, I can distinctly recall my time in these games, which colored my expectations going into Dark Souls 3. To my surprise, and somewhat to my disappointment, the game didn't feel the way I expected it to. Though it certainly is a shining example of what could be described as a Souls game, Dark Souls 3 felt different than its predecessors. As I explored the desolate lands of Boletaria and Lordran, there was a palpable sense of loneliness to the proceedings. It was as if I was cold and alone against a world out to kill me, with its bands of diverse and terrifying opponents setting their differences aside in a concerted effort to block my path and take my life. 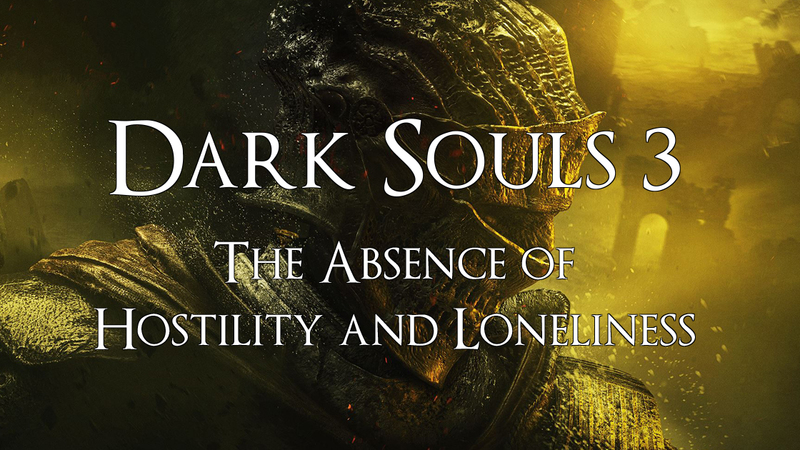 Despite in many ways going against those same odds, I never had that feeling of isolation and hostility in Dark Souls 3. Rather than a world against me, it felt as if every area was merely a stage for I and my fellow players. Much of that simply stems from the fact that there are many more players in Dark Souls 3 than there were in previous Souls games I had played. My first runs of Demon's Souls and Dark Souls were both in the summer of 2015. By then, the games were 6 and 4 years old respectively. There were certainly stragglers like myself who were still engaged with them, but by and large most had already moved on to greener pastures. And even if people were playing these games, my efforts to work with them were minimal. In Demon's Souls, I spent almost the entire game in Soul form, preventing me from summoning phantoms to aid me. Likewise, I can count the number of bosses I defeated with other players on a single hand. My experiences in both games are mostly mine and mine alone. When push came to shove, I could only rely on myself to get out of a hairy situation. I can't say the same thing when I look back on the total sum of my Dark Souls 3 experiences. Strangely, I was excited to, for once, be a part of the community as the game comes out, exploring it together with everyone. In a way, this ended up being counter to what I most enjoyed in its older siblings. Talking with my Twitter friends, being guided to secrets by random strangers, aiding other people and being aided in turn, these were all wonderful experiences in their own right. However, it meant that my journey was less a result of my own effort and accomplishments, and more the gestalt of all of those who joined me on my path. Random strangers who I will never know, and who will never know me, were all working together to achieve a common goal. Even when I was invaded/invading, it felt like a respectable contest between peers and less an attempt of one person to sabotage another. I could use many adjectives to describe my adventure, but “lonely” is not one of them. The NPCs also seemed a lot more welcoming in Dark Souls 3 than they have been in the past. My runs of Demon's Souls and Dark Souls are marked by a sense that there weren’t many people in the world that would even think to assist me. Outside of the Nexus, I remember that non-hostile NPCs were scarce. It was at least 10 hours before I brought my first new NPC back to the Nexus with me. Until then, the ones I had encountered had either perished unceremoniously (sorry Ostrava), or actively screwed me over (which is why, to this day, I murder Patches every chance I get). Just finding a truly friendly face was a rare treat. The same can be said of Dark Souls. While there are certainly a few kind folks who inhabit the Firelink Shrine, most of them are battered and broken when you find them. And by the time I finished my journey, the most friendly of the lot, like Siegmeyer and Solarie, had met with terrible fates. By contrast, in my first 10 hours of Dark Souls 3, I encountered a Robin Hood-esque thief, a young woman who knows miracles and her protector, an old pyromancer, a Darkmoon blade from the Sunless Realms, and Siegmeyer's more capable descendant. All of these people had offered their aid to me in some form, either as a vendor or a companion. Where friendly faces were rare before, they were quite common place now. I did not have to look far to find someone with a vested interest in my success. Far from the isolation I once felt, Dark Souls 3 provided an almost constant comfort by offering me my choice of assistants and allies. Even though the abundance of other players and NPCs are large contributors to why I have lost that adventurous, yet isolating spirit of the previous games, there is another reason. At this point, I have played so many Souls games, and particularly so many Dark Souls games, that the mechanics and world are largely ingrained into my mind. When I was a new player braving the perils of Boletaria, and later Lordran, I often fell for the tricks and traps laid about. I would die to ambushes than I should have seen coming in hindsight. I spent many deaths learning each enemies attack patterns and figuring out the weaknesses therein. I crashed through broken boards and into traps that would be noted and avoided in the future. The designs of From Software were alien to me. Learning them was half of the battle, and half the fun. Unfortunately, there's only so far the Soulsian “fair” ambushes can go before they reach the territory of just spawning in mooks in lieu of hiding them in creative ways. That's not necessarily From Software's fault, because it is infinitely easier for players to figure out their tendencies than it is for them to think of new ways to surprise those same players. But it does mean that I have gotten much better at predicting when an ambush is likely to happen than I used to be. I don't remember ever being truly caught off guard while exploring the shattered remains of Lothric and the lands surrounding it. At the same time, I have a distinct memory of an archway in Irithyll of the Boreal Valley. I had not seen nor heard any enemies in the room on the other side, but I suspected that something was “off”. Looking down and to my left, I saw a ledge that I could easily reach by dropping down. Going into the hallway through the opening on this ledge, I climbed a ladder that lead me to the other side of the room beyond the archway, bypassing a group of enemies waiting to ambush me. By just following a slight “off” feeling, I had anticipated and subverted a snare that I would have easily fallen for before. At the time, I felt smart for having trusted my instincts. In hindsight, all I really did was just fall back on knowledge I had gained from 4 previous games' worth of experience. Not only wasn't I surprised by the enemies’ tricks, I couldn't be, because I had already fallen for them before. Instead of making me believe I was a single man out against a world which wants nothing more than me to fail, Dark Souls 3 felt like reuniting with an old friend I hadn't seen in awhile. There's nothing inherently wrong with that quiet nostalgia. But the dreadful anxiety I experienced the first time, as I explored the worlds of Demon's Souls and Dark Souls, is a large part of why I fell in love with the franchise. As disappointing as it is, I'm not sure that one could ever adequately capture that atmosphere that drew me in when I first started Soulsborne. Though I want so badly to feel that isolation, that growing sense of isolation and excitement. I just don't believe it's possible given how large an influence Soulsborne has become. It's hard to feel alone and afraid when in the comfort of your home, surrounded by the old and familiar. These games have become as much a home to me as the house I live in, and that's exactly what I don't want them to be.